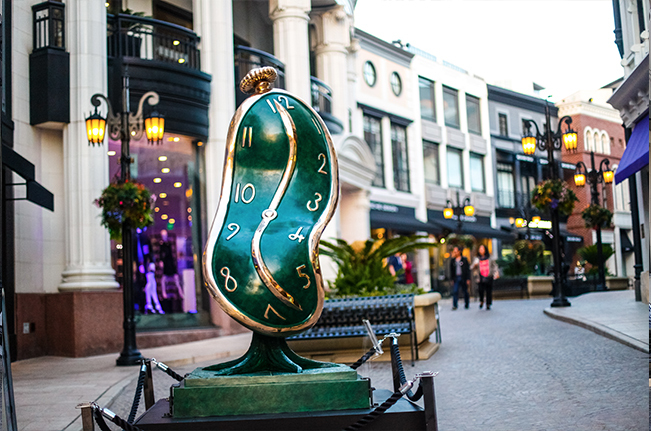 In partnership with Galerie Michael, with sponsorship from Beverly Hills Conference & Visitors Bureau, Two Rodeo Drive unveiled Dali Exhibit at Two Rodeo Drive, which marked the first and largest outdoor showcase of Dali’s sculptures in the United States. This was a world class exhibition of 12 iconic Salvador Dali sculptures on display at Two Rodeo Drive. The exhibit highlighted Dali’s three-dimensional bronze monumental sculptures that were up to 12 feet tall as well as museum-sized sculptures that ranged in size from four to nine feet. Each sculpture highlighted Dali’s untamed imagination, offering onlookers a surreal and unique experience.